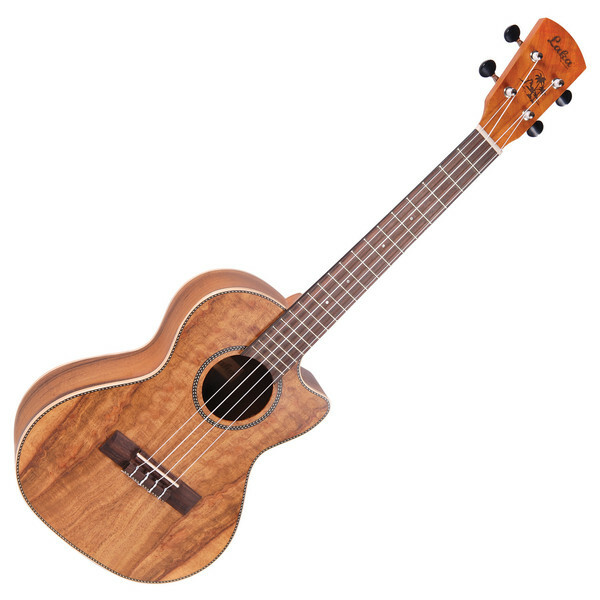 The Laka VUT90EA Tenor Electro Ukulele has a solid Koa top along with laminated Koa back and sides with single cutaway, Mahogany neck with Nato fingerboard plus Grover machine heads. The Tenor ukulele is a big ­sounding uke with a 17" scale and has a great look thanks to its open pore satin finish and body binding. The VUT90EA is fitted with a Fishman Sonitone Preamp. The Laka VUT90EA is made from high quality Koa. With an open pore satin finish and strung with premium Italian Aquila strings, this Laka Ukulele offers fantastic performance and sound. All Laka electro acoustic ukuleles are fitted with USA made Fishman Sonitone preamp systems. These concealed soundhole-mounted systems do not detract from the fantastic look of the Laka ukuleles but offer a professional sounding system that is also extremely user friendly.